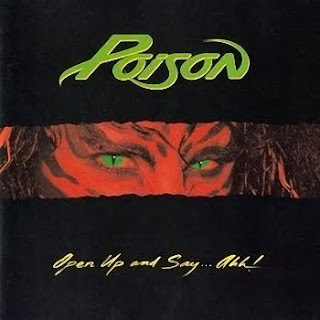 If a case needs to be made that grunge was necessary to sweep away the most ridiculous excesses of what some sub-genres of metal had grotesquely evolved to, then Exhibit One may well be the music of Poison. That this group of talentless so-called musicians achieved success at the peak of the glam-metal scene of the 1980's can be taken as a sign that the apocalypse was necessary. If grunge did nothing else but put an end to grown men dressed as women achieving great success despite delivering moronic anthems while possessing a talent level equivalent to the local high school band, then grunge was a good thing. Open Up And Say...Ahh! was Poison's second album, and featured 10 tracks that redefine the lowest common denominator in terms of dim-witted drunk-time rock 'n' roll. And proving that you can get rich by dramatically lowering the standards of public taste, it sold 8 million copies, with many insta-fans attracted by the schmaltzy ballad Every Rose Has Its Thorn (oh really?). That this tepid track is actually better that most of the other mindless tripe on the album is beyond pathetic. Glam in general and Poison in particular represent one of the deceptively successful but ultimately diseased branches sprouted by the metal tree. Fortunately, nature corrected course, sawed-off the poisoned limb, and metal regrouped and ultimately thrived in other directions, leaving glam as nothing but a contemptible - and bad - memory. Produced by Tom Werman. Engineered by Duane Baron. Mixed by Duane Baron, John Purdell and Tom Werman.